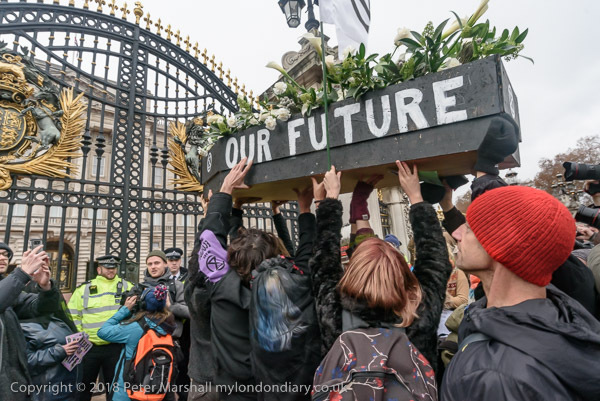 Perhaps the most surprising part of the Extinction Rebellion Day came outside Buckingham Palace, where protesters marched up to the impressive front gates behind teh ‘OUR FUTURE’ coffin, at first raising it up, and then lowering it to the ground in front of them. 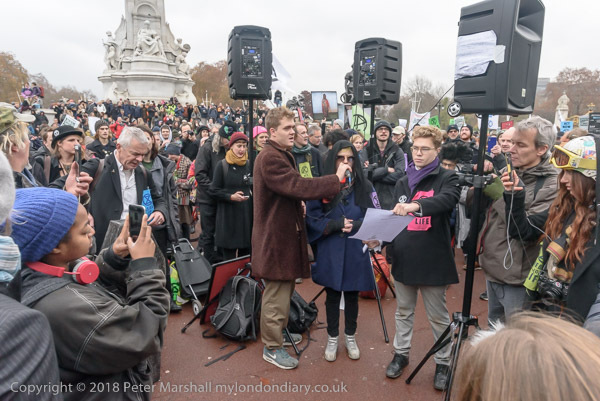 I think people didn’t know what to do next, though there was some noisy shouting of slogans and then many of us started to wander away and see what was happening behind us. 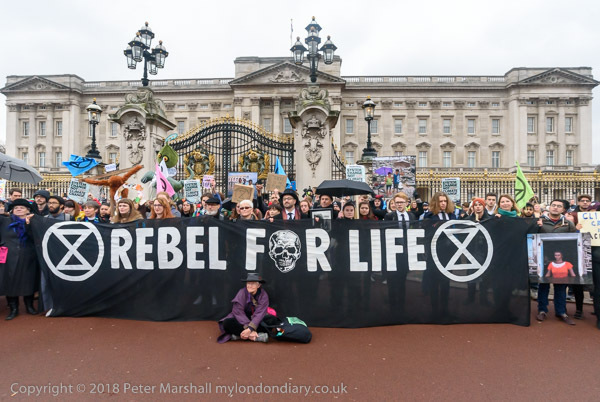 There was a crowd behind the ‘REBEL FOR LIFE’ banner, with an empty space in front so that people could take pictures. This was one of many occasions where the 18-35mm was not quite wide enough, and I really needed the extra 2mm of the 16-35mm, unfortunately broken beyound economic repair. I do have another, even wider full-frame lens, a Sigma 12-24mm, but the image quality falls short of the Nikon lenses so it gets left at home. Normally I’d use the 16mm fisheye to get a wider view, but I know this isn’t really satisfactory when looking at rectangular objects – such as the banner and the palace – head on. The banner would be considerably taller in the centre than at the edges, as the camera to subject distance is further for peripheral objects; while this makes sense in terms of optics, it just doesn’t look right. I seldom like to photograph banners (or buildings) head on, but for this image it makes sense, and I was just able to get back far enough to squeeze it all in. I did also move to one side to use a more oblique view – as you can see on My London Diary. 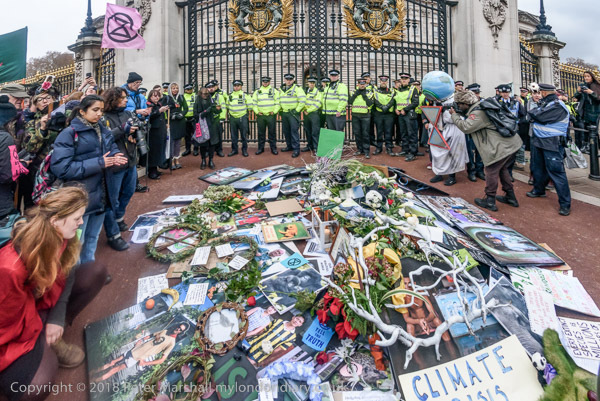 There was some uneasy grumbling in the crowd as Gail Bradbrook of Extinction Rebellion read a very humble address calling on the Queen to get her government to take the urgent action needed to save her country – and the world. Certainly as I noted, some in the crowd would have been happier to bring a guillotine. There was rather more unity behind yet another joint reading of the ‘Declaration of Rebellion’. 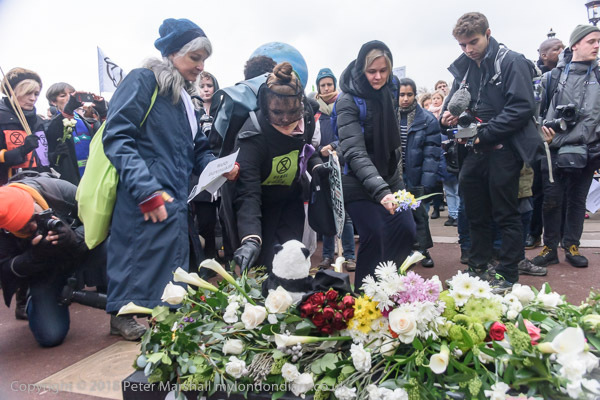 There was then a period of silence in memory of those who have already died because of glabal warming, after which people were invited to bring their wreaths flowers, placards and other objects to lay on top of the coffin, which was soon under a large pile. The protest ended with dancing, while at least one person superglued herself to the railings by the main gates. 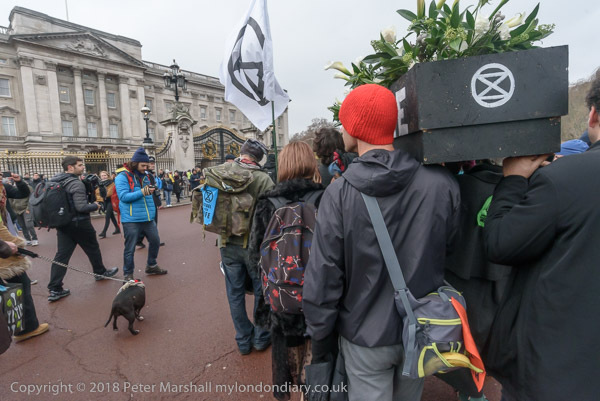 Pictures of this and much more are on My London Diary at Extinction Rebellion Buckingham Palace. This entry was posted on Friday, January 25th, 2019 at 08:42 am and is filed under My Own Work, Photo Issues, Political Issues. You can follow any responses to this entry through the RSS 2.0 feed. You can leave a response, or trackback from your own site.